This post may have affiliate links, please check the full disclosure on this post. I just came across a flower floor pillow searching for something else on the internet and I immediately fell in love with them! I constantly find my niece sitting on a naked floor. It doesn’t matter if the whole room is covered with carpet, she will find the best spot where the floor is not covered and she will sit right there. And not just that: it would probably be the spot right behind a door where anyone opening the door could hit her or where the draft is the strongest. I bought for her a 100% made out of wool rug and her mother got her big plastic puzzles where she could sit on. This seems to have solved the problem. But oh if I had seen one of these gorgeous flower floor pillows! I would have gotten one for my niece in a heartbeat. They are just so perfect for little girls. Just take a look how beautiful they look. And besides the attractive look, designed to be so appropriate for little girls, these pillows will be the perfect solution for a child sitting on the floor of the room. 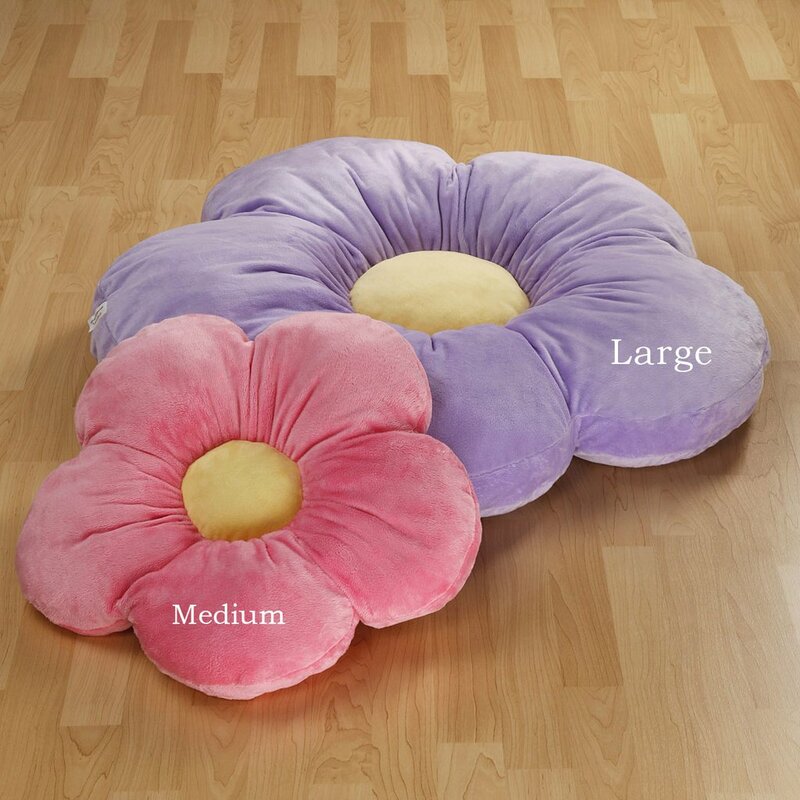 These flower floor pillows will provide protection from cold and give the necessary softness for sitting. Not to mention the absolutely gorgeous decorative element that they will bring to the child’s room. I wish these existed in my city or at least they shipped to my city. I really think they are a wonderful addition, both in a practical and aesthetic aspect of a girl’s room. I have gathered the best collection of flower floor pillows below so take a look and enjoy! You can find these these flower floor pillows in many vivid colors: you can get one in pink, purple, green, hot Pink and Blue. Besides the color they come in 3 different dimensions:16″, 20″ and 35″ Diameter. They make it easy for you to cover a corner of the room or another small area. The big one of course is reserved for the center of the room. Even if you have a carpet in your child’s room these pillow will still be interesting to have. They provide soft cushion for whatever activity your child is doing on the floor. And the floor is definitely the favorite spot for kids. Another great thing about these daisy shaped pillows is the fact they have been intentionally made for easy washing. The whole pillow is machine washable and with kids this is a very important feature. The material is stain resistant so you can be sure that the pillow will keep its beautiful look even when your child is doing its thing while using it. The material the pillow is made of is ultra soft boa, it is plush and huggable. These pillows have been used for babies to make them sleep, for toddlers and I have read even some adults bought them as decoration. They are so adorable and everybody loves having them. They make great gifts for girls too! And they are quite a unique non toy gifts and they have this surprising element in them. Perfect for birthdays or Christmas. These fluffy pillows are a perfect addition to any girl’s room. They look so cute that they can only bring freshness to the room. If you have a yard these pillows can also be used outdoors or on the porch. Just perfect little cushions that also look fantastic. Girls were thrilled to have these amazing flower floor pillows and I truly believe that if you decide to get one that the money spent won’t be wasted money. I mean how many toys have you bought only to find them in some corner after the initial curiosity passes? I’ve had my share of those toys and I bet so does every parent. But this pillow will last a long time and be in use for a long time. It is impossible any other way! These flower shaped area rugs will be a good solution if you have small kids. There are some places in the home where the floors are not covered and small kids spend most of the time playing on the floor. I am not comfortable with my niece, a 4 year girl, sitting even on a wooden floor. These cute area rugs are soft enough to make sitting on the floor comfortable. They will certainly protect a child from cold. They are made of ultra soft boa and foam pad. The back is made of non-skid latex and I really like that they thought of the slipping part. These flower rugs come in 1 dimension: 25 inches in diameter. Just a perfect medium size to fit any girl’s room. Usually the kitchen has not covered floors so they will be also very appropriate to put there, at least while the child is small. With these rugs you don’t have to worry about stains: they have been made stain resistible with particular accent to easy cleaning. We all know how kids love spilling things over and making stains. I love the colors of these home floor daisies: green, pink and purple. And they have a mixed color inner circle which makes them more fun. Another great thing is that you can get them separately or in set of 3. These flower floor rugs for little girls are a perfect decoration and you can use them even if there is a carpet to make the room more fun and to add cheerful variety. They will serve as soft and warm sitting spots on the floor, very useful when kids are playing. And who knows what these daisy rugs will become in a kids imaginary world! Now this flower shaped pillow is smaller in size: 40cm / 15.7inch and is better suited as a decorative pillow for bed but it is such a cute flower pillow that I just had to include it in this collection. It comes in 3 colors: blue, red and yellow. Extremely fun decorative pillow for a girl’s room or baby nursery. If you want to give a unique gift for a little girl then this pillow is perfect as a gift. Everybody is giving clothes or toys. We have never received a pillow gift for my niece and a pillow is something every girl can use at least as a decoration to make her room more pretty. It is soft enough and sturdy enough to be used as a chair cushion or when sitting in bed. It is made of ultra soft boa and is machine washable. Easy to maintain and clean. Overall a very cute and useful flower shaped pillow that will make any little girl very happy with its shape and bright colors. 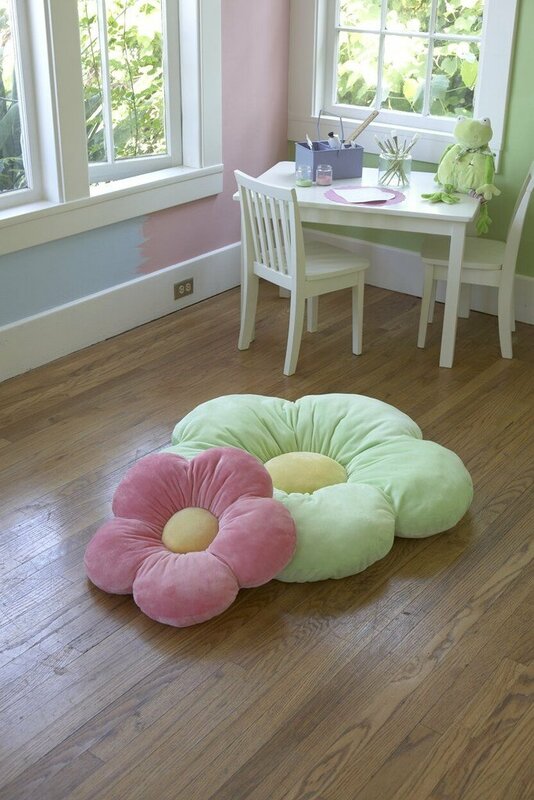 These are so lovely flower floor pillows that any girl will love having and I bet they will be used every day, especially when the child is having friends over at her room. You may even want to get more of these for all her guests! Purple Dream Catcher – The Best Choices! Homemade Low Carb Ice Cream – Quick And Easy! Corner Toilets For Small Bathrooms – Make Your Small Bathroom Look Bigger! Solar Flower Garden Stakes – Perfect Gardening Gift!